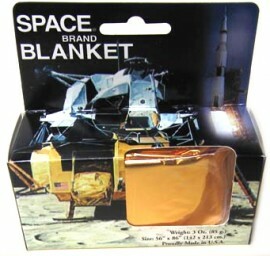 Space blanket - spacekids - space toys, dressing up costumes, kids spacesuits, astronaut food, cool space stuff! A piece of genuine down to earth space technology! The space blanket is a genuine NASA spin-off product, directly related to the external insulation products actually used on all space missions. The space blanket was developed in 1964 and has been a vital component in protecting astronauts from solar radiation and to shield sensitive equipment in outer space.